Arguments cannot be avoided in relationships. Usually, we handle them badly. Consider an argument, any type of argument between you and your partner resulting in the country having to go to war. Would we have to go to war because you could not yield; or are being stubborn? Would we have to go to war because it had to be done your way, or perhaps you go on emotional tangents, thus blocking your ability to see a different perspective? Probably not. You would consider your position for the greater good. You would consider the pros and cons for both sides and make the best decisional response in your argument. The same concept should apply to your relationship. Your argument should be constructive, and logical. Not based on emotional feelings alone. 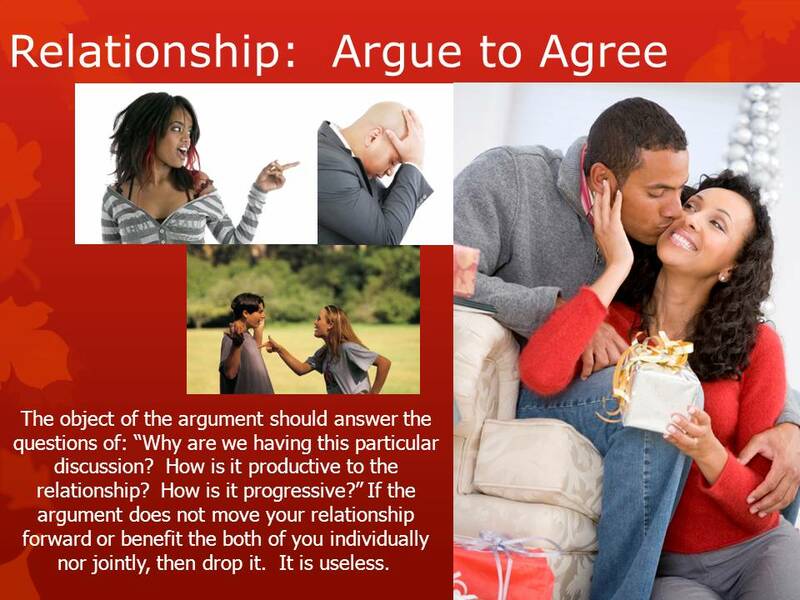 Arguments call for both partners to be objective. If the argument with your partner resulted in saving lives, you would most likely be bartering, compromising, rethinking your position or looking at your partner’s position objectively. There are lives weighing in on your argumentative position. Your relationship after ending the argument is extremely important. It will not have to create world peace, but peace is crucial to your togetherness and harmony as a couple. Arguing to agree, should be the shared foundational understanding. Meaning, that both of you will provide different vantage points on both the approach and expression of your argument. During the course of an argument, responding defensively causes an offensive response from your partner. Both responses remove the focus from the subject of discussion. It puts both partners in the position of having to emotionally self-protect. Once this happens, the argument becomes bigger than it needs to be. The object of the argument should answer the questions: “Why are we having this particular discussion? How is it productive to the relationship? How is it progressive?” If the argument does not move your relationship forward; nor benefits you individually or jointly, then drop it. It is useless. I simply ended the conversation by saying, “This makes no sense to me. I am not going to argue with you about someone who is dead. I have work to do that I have to get back to. I am going to say goodbye and hang up.” This made more sense to me, rather than going on and getting more involved about something that had nothing to do with us. We hung up. When it comes to your feelings, try to be as objective as possible. If your feelings cannot be validated by something concrete or if they cannot be supported by an absolute, a statistic, or experience, do not create an argument on an emotional tangent. Proceeding down this path, will be more destructive to your relationship, than productive. This entry was posted in Settling and tagged arguing with your partner, relationship agreeing to make peace during an argument, relationship arguments. Bookmark the permalink.